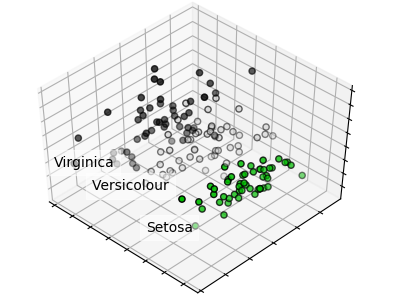 Principal component analysis (PCA) is a technique used to emphasize variation and bring out strong patterns in a dataset. It’s often used to make data easy to explore and visualize. Linear dimensionality reduction using Singular Value Decomposition of the data to project it to a lower dimensional space. First, consider a dataset in only two dimensions, like (height, weight). This dataset can be plotted as points in a plane. But if we want to tease out variation, PCA finds a new coordinate system in which every point has a new (x,y) value. The axes don’t actually mean anything physical; they’re combinations of height and weight called “principal components” that are chosen to give one axes lots of variation.